A blocked drain is as nasty as it sounds. It looks nasty and will start to bother you so much. 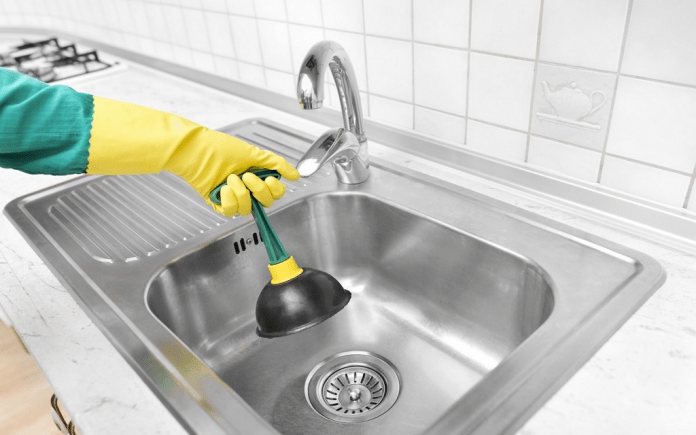 The water doesn’t drain in and settles in the sink for so much of the time –Eww! And of course, you shriek at the idea of using your hands to clean the nasty stuff out. Clogged drains can be stubborn and may take some while to get them cleaned out all properly. Here is a list of some DIY home drain cleaning methods that may relieve you from those clogs. You can find them easily in stores, but be careful with handling them. They are really toxic and should be kept away safe from the reach of children. It can cause harm to the skin, hair, and eyes. It’s just best to shun them away and depend on some DIY home improvement methods. Take any solid wire you can find. Say a wire hanger and straighten it out. Create a hook out of the wire you have, your work will reduce if you choose a hanger. Ideal for cleaning light drain clogs. Fill the sink with enough water and put the plunger on the drain firmly. Give it a plunge and repeat the process. While a hooked wire also works fine, a barbed wire does the same wonders. You can get a barbed wire easily from the market or a similar looking wire or a piece of plastic lying around your house may do the job. Simply put the wire inside the drain and start fishing stuff out. The most popular amongst them all, baking soda and vinegar really helps to clean that stubborn drain and remove any smell lurking around. Take one cup of white vinegar and half a cup of baking soda. You can either prepare the mixture of above two or put them separately in the drain. To make a mixture, mix the above two ingredients and immediately put it down the drain. The mixture will start to fizz and let it sit for some 10-15 min. Run it down with some hot water. The method best works if repeated monthly. Boil the water as much as you can. Now pour it down the drain in some intervals. Repeat the process monthly to get the best results. Very similar to the vinegar and baking soda method. Mix half cup of salt and equal quantities of vinegar. Pour the mixture down the drain and run with hot water. Take half a cup of dish detergent and mix with some hot boiling water. Pour it down the drain and next use a plunger. Try plunging out as much stuff as you can. A very effective method to clear out grease from your drain pipes. Wrap a heating pad over the pipe under your sink and start with heating. Heat for a while as this will melt all the grease present inside. Run the drain with hot water to clear out the grease. Do not wait for your all pipes to get clogged and then start with the cleaning process. The above methods are to be repeated from time to time in order to get a clogg-free drain always. You can just do a research online and get many more ways of drain cleaning. But you have to make sure you do it in the right way.